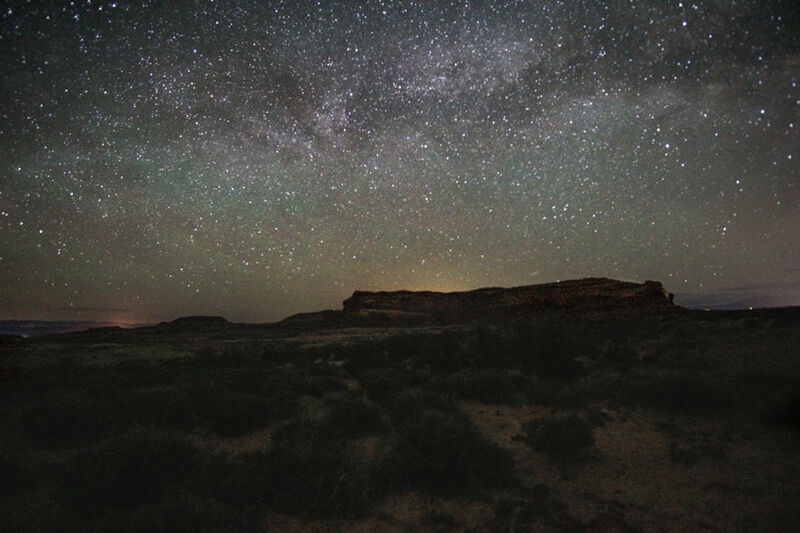 Canyonlands National Park consists of 4 sections: The Island in the Sky, The Maze, The Needles, and the rivers. Accounting for around 77% of visitors, the Island in the Sky rises a thousand feet above the surrounding landscape, and offers hiking trails, easily accessible viewpoints, and soaring canyon walls. 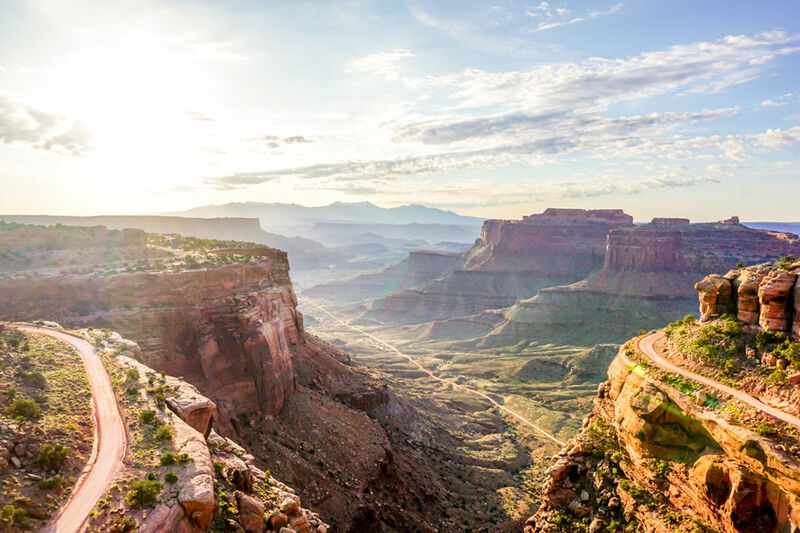 The entry to Canyonlands National Park is awe-inspiring. Start at the Island in the Sky Visitors Center and then take in the view honoring the park’s name. From a short hike to catch the sunrise at Mesa Arch, we were heading back to camp, when we decided to stop and witness the colossal canyon walls and White Rim Road soaking in the morning light. Mesa Arch is an easy 0.7 miles round-trip hike. 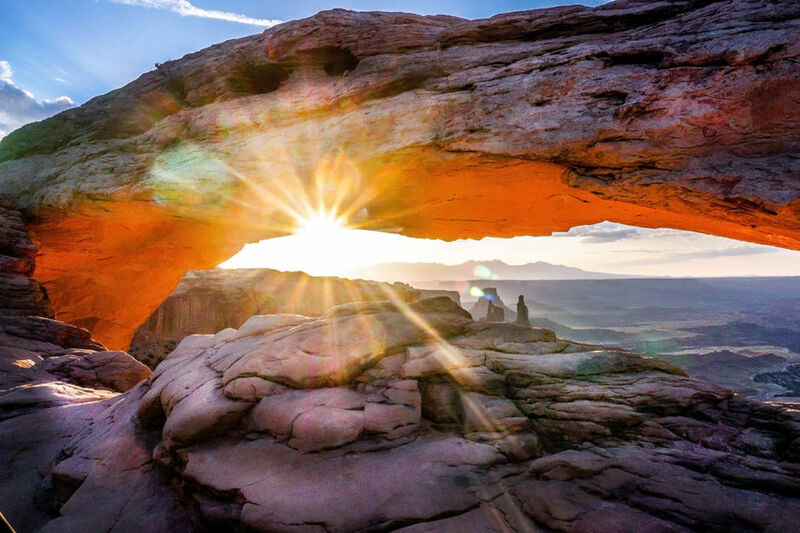 This is a popular sunrise hike for the way the arching stone frames the rising sun. Although you may need to set your alarm at four in the morning and arrive to a wall of tripods waiting for the spectacle, the first morning rays make the experience worth every moment. We arrived at our campsite fairly late, with stomachs growling and tired muscles, but in good spirits. Final rays of light from the evening sun disappeared behind the canyon walls, as we set up our tents and stuffed our bellies. When we finished, we looked up to a sea of stars above us, sparkling like the sun playing on tips of wind ridden waves. We lay down in the red dust and talked for hours about how tiny we felt -- and how important it is to feel that way every once in a while. 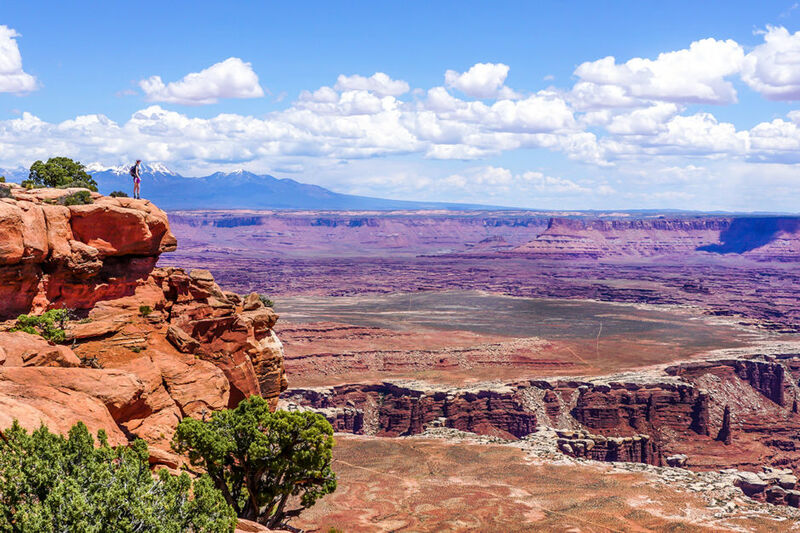 Panoramic views showing the enormity and grandeur of mother nature are not in short supply in Canyonlands National Park. Easily accessible viewpoints offer the opportunity for anyone to pull up and experience the intensity of the natural world. The Upheaval Dome is an easily accessible marvel that leaves visitors and specialists wondering how it came to be. 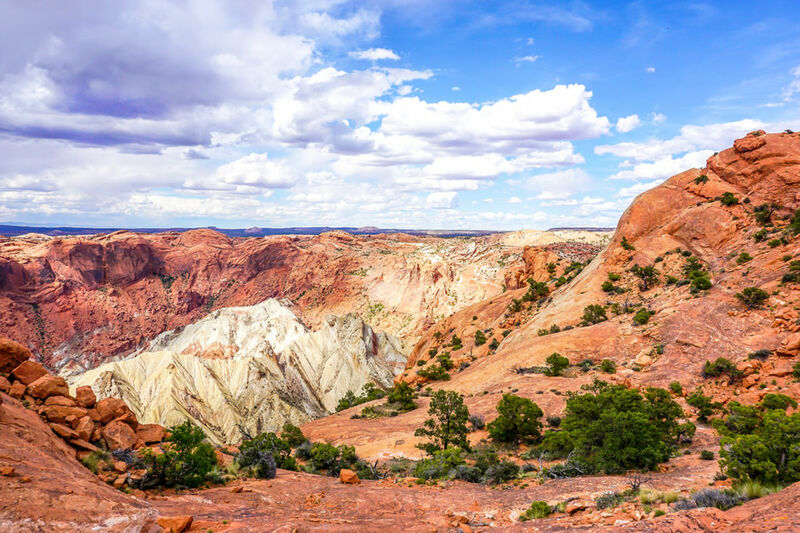 And although the creation of the structure may be the result of an 800-foot meteorite or a salt bubble from ancient seas, the unknown origins of the Upheaval Dome make the 1.8-mile round trip hike even more appealing. This support vehicle carries the dust-covered gear and a rich abundance of water for a group of heat-defying cyclists. 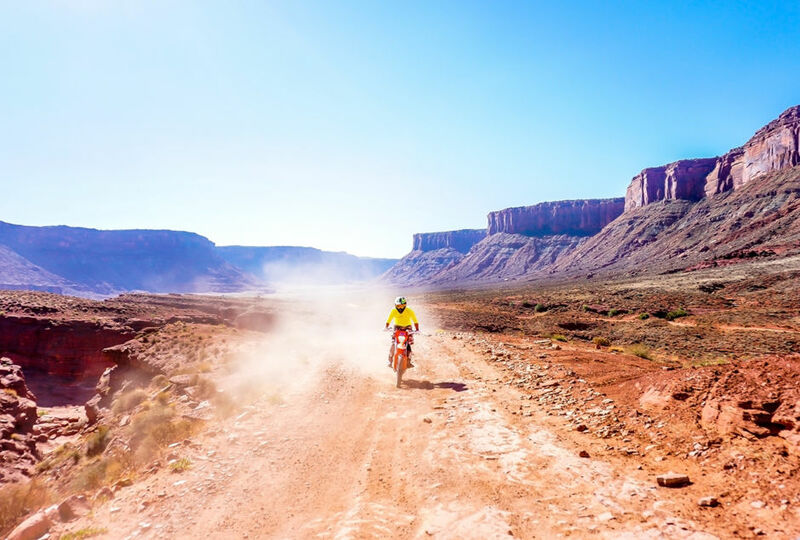 100 miles long, White Rim Road attracts 4-wheel, high clearance motorists and avid mountain bikers alike. 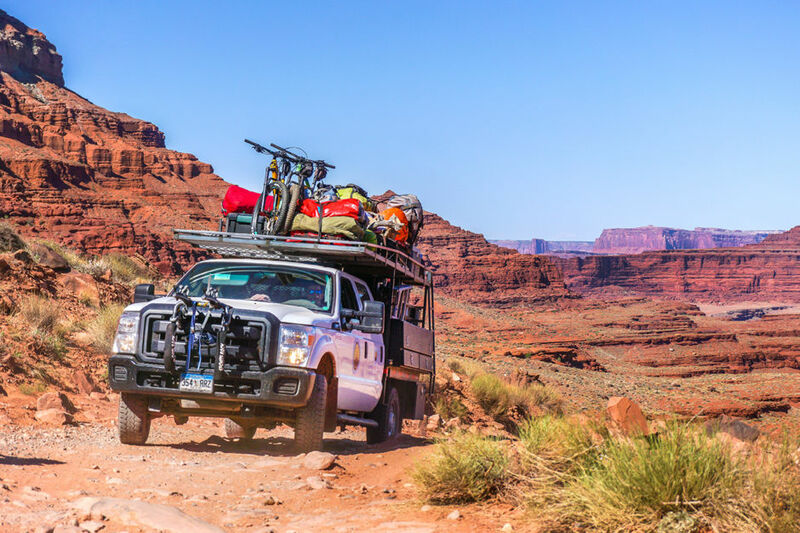 Typically taking around 3-4 days by bike, the road grants amazing vistas and the opportunity to camp in the parched backcountry of Canyonlands. This area has no potable water, little shade, stretches of deep sand, and steep climbs, so cyclists are required to have permits, and are highly encouraged to hire support vehicles. Jimmy creates a veil of crimson dust as his dirt bike speeds over the trail. At the end of the day, our badge of adventure was the red Utah desert earth that we wore on our skin, clothes, and hearts. The streets of Moab are known for crawling with earth conquering UTVs, ATVs, and OTVs. 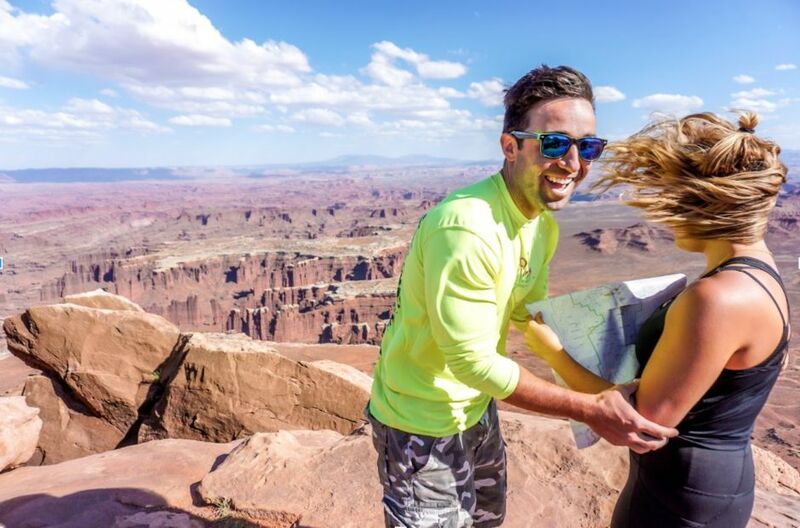 Within Canyonlands National Park, however, the scorched backcountry roads are reserved for gutsy mountain bikers, experienced dirt bikers, and 4-wheel high clearance vehicles like Jeeps and trucks. Desert does not necessarily mean barren. 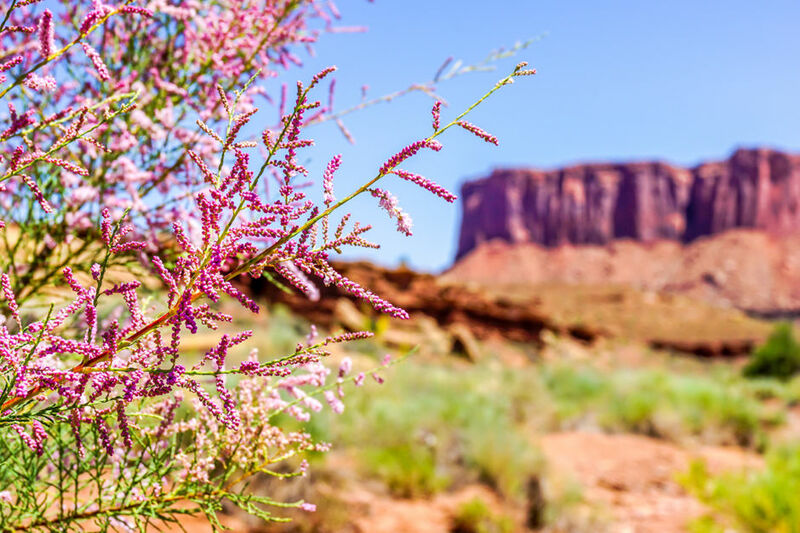 Canyonlands is filled with a unique range of flora and fauna, and the Island in the Sky offers trails ranging from easy to strenuous so visitors can experience all of them, by walking. This day we chose to hike the Murphy Loop Trail, a 10.8-mile loop with a 1,400-foot elevation change. The Murphy Loop Trail carries you through sweeping vegetated areas, into seemingly bottomless canyons, and through the desolate backcountry. After stopping at the ranger station to ask way too many questions and refill our empty water bottles, we made our way across Island in the Sky to the Grand View Point Overlook. Using a map, Jimmy and Claire attempt to identify geologic features as we bask in the afternoon light. The National Park Rangers offer endless advice and knowledge on all topics ranging from why that rock is red and not black, to where you should hike if you’ve been watching a little too much Netflix lately. It’s always a great idea to stop in to gain some knowledge, plan your trip, or just say hello.